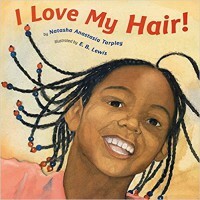 I really enjoyed reading I Love My Hair by Natasha Tarpley. This book serves a greater purpose than just a good story. It teaches young girls (and even boys) to love their hair (or any other characteristic) and its uniqueness. Specifically, this book tackles the long history of young, black girls disliking their hair because it is "different" from everyone else hair. This book highlights all the great things her hair can do and all the different ways she can wear it as well as the heritage and culture of her hair. I also love the use of positive similes and metaphors when comparing the main character's hair to objects. I would read this book to the class, pausing to discuss with students the ways her mom does her hair, the different styles she wears her hair in (and ask the student what their favorite hairstyles are), and feelings towards her hair (compared to the student's feeling towards their own hair), etc. After reading I would ask students to write a paragraph that connects the book to themselves or their own hair. I would ask them to use evidence from the text to support their connection.